The MS-160, 40-1600X Microscope now comes bundled with a smartphone adapter! With the smartphone adapter you can take pictures or video of your specimen through the microscope and share with friends and family. 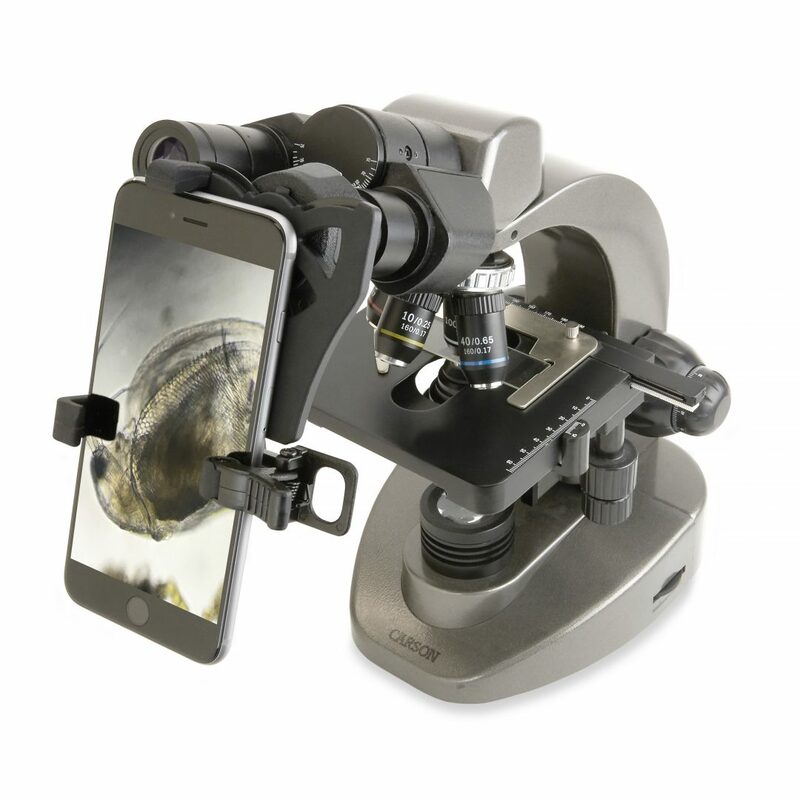 Connect the included adapter to your smartphone and attach to the microscope. Will accommodate all the popular smartphones on the market. The Microscope is an advanced level Biological Microscope that is ideal for the university student, industrial professional or doctor. The Microscope has a binocular head, at 30 degree angle for comfortable viewing, and is rotatable 360 degrees for easy sharing of the specimen view. The stage is a double layered mechanical stage with a sizable travel distance. The Biological Microscope has both coarse and fine focus knobs to help the user to achieve a sharp focus, and comes with two sets of wide field eyepieces: 10X and 16X. The Biological Microscope has LED illumination which provides a bright white colored light and also has an intensity control knob and an 1.25NA Abbe Condenser with iris diaphragm to set the optimal lighting conditions. The Biological Microscope has a filter holder with included blue color filter. The included AC power adapter allows for use internationally without the need for a voltage transformer.